Now, more than ever, local governments and community organizations must utilize multiple funding streams to finance strategic redevelopment. Panelists will discuss how to think creatively about finding the resources to make investments that will catalyze neighborhoods back to functioning at market-rate. Speakers: Kip Wahlers, Partner, Ice Miller (moderator); Nick Fedor, Economic Development Director, Detroit Shoreway Community Development Organization; James R. Klein, President and Chief Executive Officer, Finance Fund; Dominic Marchionda, NYO Property Group; Kristi Tanner, Managing Director, JobsOhio; Scott Ziance, Partner, Vorys, Sater, Seymour and Pease LLP. Policies can help or hinder local nonprofits, governments, and the private sector to effect community transformation; and policy solutions do not always reside at one level of government. In this session, panelists will discuss instances where working at the local level may be more effective, the interplay across state and local policies, and strategies for working in each context. Speakers: Lavea Brachman, Executive Director, Greater Ohio Policy Center (moderator); Michael Brady, Vice President of Policy, Center for Community Progress; Frank Ford, Senior Policy Advisor, Thriving Communities Institute; Stephanie Moes, Attorney, Legal Aid Society of Southwest Ohio, LLC; Thea Walsh, Deputy Chief, Office of Redevelopment, Ohio Development Services Agency. considerations, and the necessity for strong governmental and community partnerships. Counsel, Lucas County Land Bank. Limited funding for reduction of blight within our cities requires a strategic approach to demolition and rehabilitation within neighborhoods. The first step is an accurate inventory of the housing stock – including occupancy status and condition of the property. Thriving Communities Institute received a grant from The Nord Family Foundation to conduct a property survey in the City of Lorain. This session discusses the planning, implementation and results of the Lorain Survey and how other municipalities could benefit from a property inventory. Speakers: Paul Boehnlein, GIS and Conservation Planning Specialist, Western Reserve Land Conservancy; Chase Ritenauer, Mayor, City of Lorain; Sarah Ryzner, Director of Projects, Thriving Communities Institute. Greater Cleveland Habitat for Humanity is moving from building houses to building communities. Now focusing on rehabilitation rather than building new homes, Habitat works in partnership with community development groups and the county land bank to restore a sense of community to neighborhoods plagued by zombie properties. Speaker: John Habat, Executive Director, Greater Cleveland Habitat for Humanity. This session explores how communities can capitalize on the preferences of Generation Y or Millennials and baby boomers, which lean toward walkable communities, easy accessibility to work and recreation, and common areas where they can congregate with peers. Ohio developers, researchers, and philanthropists will discuss the successes and challenges that are emerging from their efforts to create walkable neighborhoods in Ohio’s urban cores. Speakers: Nate Coffman, Executive Director, Ohio CDC Association (moderator); Lois J Fisher, Owner, Lois J Fisher & Associates; Jung Kim, Research Director, Columbus Chamber of Commerce, Columbus 2020; John Mitterholzer, Senior Program Officer, George Gund Foundation; Aaron Pechota, Vice President of Development, NRP Group LLC. While many policies and practices apply across the state of Ohio, there are some unique challenges and solutions for our small-to-medium sized cities. This session will offer opportunities to attendees to define a vision for Ohio’s smaller communities. Together, panelists and attendees will outline an agenda for organizing, and discuss strategies for mobilizing political will to get systems in sync, at the local, regional and state level. Services of Greater Cleveland; Deanna West-Torrence, Executive Director, Mansfield North End Community Improvement Collaborative. the establishment of a community development corporation to stabilize neighborhoods and attract new residents, all without the investment of general fund dollars. Speaker: Sally Martin, Housing Manager, City of South Euclid. approval on environmental issues such as asbestos and other hazards that must be evaluated and remediated or abated. In this session we will review everything we have learned from the initial assessment to the guidelines for post demolition site conditions. Speaker: Cheryl Stevens, Director of Acquisition, Disposition and Development, Cuyahoga Land Bank. rehabilitation of certain vacant and abandoned properties. This session will discuss evaluating properties and establishing criteria for rehabilitation; developing partnerships with local contractors, community organizations, local governments and individuals looking for “handyman specials”; structuring deals from straight transfers to deed-in-escrow programs; and other elements of the rehab process. 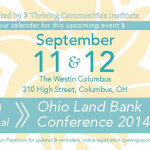 Speaker: Dennis Roberts, Director of Programs and Property Management, Cuyahoga Land Bank. agency protections, results, and lessons learned. This strategy is particularly effective in combination with a County Land Bank. Speakers: Marie Kittredge, Executive Director, Slavic Village Development; Stacia Pugh, Housing Development Officer, Slavic Village Development. current work, or potential programs that they wish were in place in Ohio. Together attendees will exchange ideas, current practices, barriers, and solutions. Facilitators: Maureen Austin, Healthy Neighborhoods Coordinator, Community Building Partnership of Stark County, Inc. and Joel Owens, Director, Community Building Partnership of Stark County, Inc.
Speaker: Cynthia Flaherty, Director of Homeownership, Ohio Housing Finance Agency. This session will discuss a program currently being implemented by the Trumbull 100, Trumbull Neighborhood Partnership and gregg’s gardens, to revitalize Warren’s central city residential neighborhoods. Speakers: Dennis Blank, Publisher, warrenexpressed.org and Volunteer Coordinator of gregg’s gardens; Matt Martin, Director, Trumbull Neighborhood Partnership. between the City of Dayton and OSU Extension Montgomery County to pilot economically sustainable urban agriculture practices on many of Dayton’s 6,000 vacant lots. The goals of the project were to bring fresh produce to inner-city Dayton families; to promote economic self-sufficiency; and to reuse vacant, abandoned land. Each of the pilot project lots required different management and production techniques. This presentation will explore a case study of the “Vacant to Vibrant Urban Agriculture Project” as well as the different methods used to grow local produce throughout the life of the project, as well as OSU Extension research related to these methods. Kristen Nix, Marketing & Outreach, Filtrexx International LLC. Speakers: Alan Mallach, Senior Fellow, Center for Community Progress (moderator); David Boehlke, Senior Associate, czb, LLC; Paula Boggs-Muething, Vice President of Community Revitalization and General Counsel, Port of Greater Cincinnati Development Authority; Terry Schwarz, Director, Cleveland Urban Design Collaborative, Kent State University. Community foundations, anchor institutions, and financial institutions are increasingly investing in neighborhood revitalization activities. Learn how these leaders are spearheading the revitalization and regrowth of Ohio’s urban core neighborhoods. Speakers: Joel Ratner, President & CEO, Neighborhood Progress, Inc. (moderator); Angela Mingo, Director, Nationwide Children’s Hospital; Peg Moertl, Senior Vice President, PNC; Michael Wilkos, Senior Community Research and Grants Management Officer, The Columbus Foundation. Across Ohio, cities are testing new and creative paradigms to address vacant property challenges. Panelists will showcase different angles of development in Dayton, Cleveland, Columbus, and Canton, such as greening strategies, utilizing anchor institutions, establishing an arts district, and prioritizing neighborhood investment. Speakers: Lavea Brachman, Executive Director, Greater Ohio Policy Center (moderator); Robb Hankins, President and CEO, Stark County Arts Council; Jenita McGowan, Chief of Sustainability, City of Cleveland; Erin Prosser, Director of Community Relations, Campus Partners, The Ohio State University; Aaron K. Sorrell, AICP, Director, Department of Planning and Community Development, City of Dayton, Ohio. finding the resources to pay for demolition and nuisance abatement. This interactive session will discuss creative legal and legislative strategies that municipalities are currently using to recover these costs, including foreclosure bond ordinances, vacant property ordinances, and civil litigation. Speakers: Frank Ford, Senior Policy Advisor, Thriving Communities Institute; Gary Davenport, Organizer, Mahoning Valley Organizing Collaborative. Like many communities that were hit hard by the foreclosure crisis, Slavic Village in southeast Cleveland has experienced widespread vacancy leading to plummeting property values. To restore the vibrancy that this neighborhood once experienced, partners came together to target resources and align expertise to make it an attractive, healthy neighborhood for residents again. Civic minded private corporations, local community development corporations, city officials and the land bank are joining to analyze data and look for opportunities from mortgage servicers as well as offering current residents technical assistance and low-interest loans to improve their properties and maintain home ownership. Klein, President, Safeguard Properties; Jeff Raig, Project Director, Slavic Village Recovery, LLC. resources to carry them out. Learn from an experienced, on the ground practitioner how to layer financial resources from multiple sources for a variety of projects, from grassroots community workdays to more sophisticated neighborhood revitalization efforts. Funding opportunities covered will include federal, state, local, foundation, bank, corporate, individual, and regional sources. Get the funding! Speakers: Ian Beniston, Deputy Director, Youngstown Neighborhood Development Corporation (YNDC). the rainfall capacity of the soil. Speakers: John Kurtz, President, Kurtz Bros. Inc.; John Ziss, Controller, Kurtz Bros Inc.
this session, representatives from Ohio’s largest banks will discuss with community developers how their work intersects through new programs and philanthropic commitments. Speakers: Lisa Patt-McDaniel, Director of Community Development, Ohio Capital Corporation for Housing (moderator); Sarabeth Anderson, Community Affairs Representative, Wells Fargo; Ryan Crowley, Head of Government and Community Partnerships, Chase Bank; Michael B. Griffin, Senior Vice President, Community Development Banking, KeyBank; Marie Kittredge, Executive Director, Slavic Village Development; Kathy Schwab, Executive Director, LISC Cincinnati. transformation. This session offers an overview of several major projects that organizations around the state have undertaken that have informed transformational changes in Ohio’s urban areas including research on brownfield redevelopment, neighborhood investment, renovation as an alternative to demolition, and business development. Speakers: Dawn Tyler Lee, Senior Vice President, Community Impact, United Way of Central Ohio (moderator); Frank Ford, Senior Policy Advisor, Thriving Communities Institute; Bill LaFayette, Owner, Regionomics; WIlliam Lutz, Development Program Manager, City of Piqua, Ohio; Jeff Rexhausen, Senior Research Associate, Economics Center. and preserve opportunities for future development. The session will also include an approach to classifying different kinds of vacancy and tailoring a response based on prevailing conditions. Speaker: Terry Schwarz, Director, Cleveland Urban Design Collaborative, Kent State University. Prove It! What are the Impacts of Residential Demolition? reduces foreclosure, and allocated funding may be repurposed for blight removal. Research on the impact of demolition on surrounding property values and foreclosure risk has been underway for the past 8 months. This session will provide the study’s latest findings. Counselor at Law, Herman Law Group, LLC; Jim Rokakis, Director, Thriving Communities Institute; Michael Schramm, Research Associate, Center on Urban Poverty and Community Development, Mandel School of Applied Social Sciences, Case Western Reserve University. Imagine repurposing a closed gray-iron foundry in Cleveland’s inner city as a “sustainable farm in the City”. The goal of The Foundry Project team is the creation of an integrated, collaborative, public-private commercial venture that combines different product lines in such a manner that they complement and benefit each other. Raising farmed-fish, shrimp, fruits and vegetables; a data-server farm; vermiculture for composting, a farmer’s market and healthy cooking classes all serve as building blocks to create over 100 new jobs and encourage a healthy lifestyle in the city. Opportunities for other supporting related businesses are limitless. This session will cover the process of imagining a project, then moving it forward toward reality. This story is not yet finished, but the process involved, the successes and pitfalls, will provide a concrete lesson for those working to re-imagine our cities. Speaker: J Shorey, President of ProActive Strategies, Inc. and President and CEO of The Foundry Project. orders, property maintenance, land affidavits for tax foreclosure, and public website content. Speaker: Michael Schramm, Director of Information Technology and Research, Cuyahoga Land Bank.